Celebrating 15 years in business with her Irish label fee G, designer Fiona Heaney’s signature is for unashamedly feminine styles incorporating her love of colour, embroidery and beading. This season marks exciting growth for the company Heaney founded with her husband, with new stockists including Fenwick’s in London as well as boutiques in Germany and Spain. 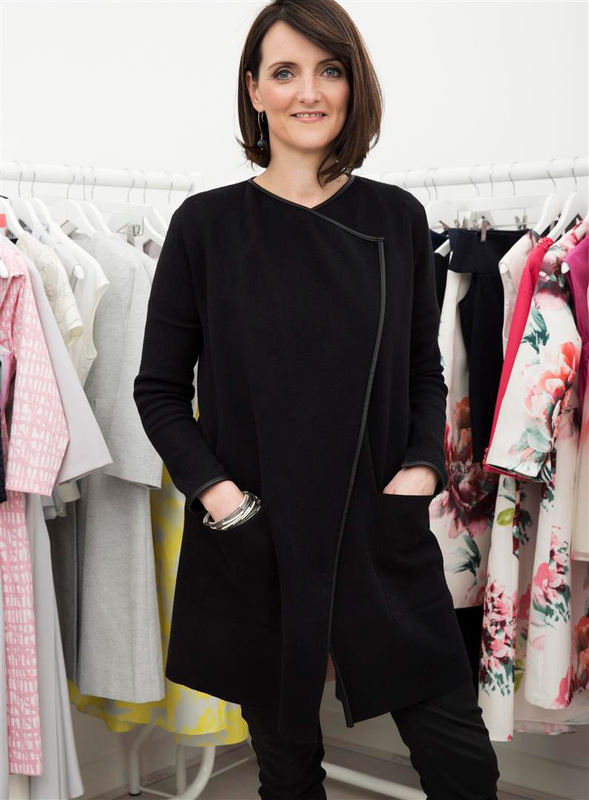 Heaney talks to us about her AW18 collection in addition to the lessons learned setting up a successful fashion business. I would say my husband. I had been designing brands for others successfully, but he pushed me to go solo giving me the confidence and financial backing to start my own brand. We were the first Irish brand to be stocked in Harvey Nichols. 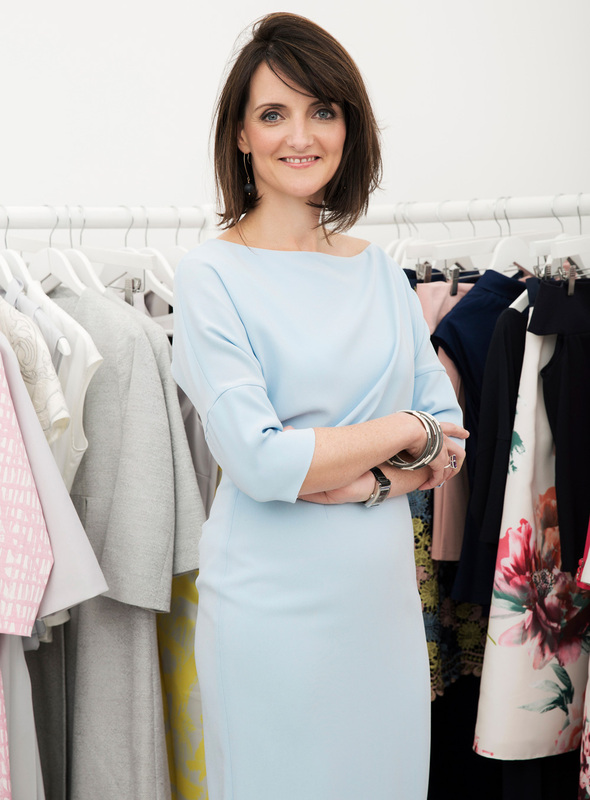 I am also delighted by the range of our loyal customers – many of whom are high profile – I was commissioned by Amy Huberman to design her bridesmaid’s dresses, while Laura Whitmore, Susanna Reid and Sabina Higgins are all clients. Getting invited to the Áras for my contribution to Creative Arts in Ireland was a high point in my career to date. What was the biggest lesson you’ve learned from start up to scale up? Mind your customers and take feedback on board, whether positive or negative. It is all about learning how you can improve your brand. What have you learned about the rules of business over the last few decades? Our brand must constantly be in touch with the end consumer and understand by interaction what these customers expect from us for next season. Social media and communication platforms has changed all aspects of business and everyday life. It is an important way to interact with the end consumer. I work in seasons so my year has a six month cycle. Every day within the six month season is very different. I could be flat sketching – designing new silhouettes in the morning, choosing fabrics and draping fabric in the afternoon. Later in the season I could be working on fittings for production, meeting with our London agent, choosing models and themes for the photoshoot. We work really fast in the office, no two weeks are the same – which is what I love about it. What are the key staples of your working wardrobe? My work wear offering is varied to suit the day. If I have meetings I would wear one of my new day dresses from the AW18 collection. This season the fee G collection offers more looser fits, stretch fabrics which are comfortable to wear and smart casual, so suitable for work. I always accessorise dresses with heels or boots. If I am working more creatively I would dress more causal, wearing a striped shirt – I like Tara Jarmon or Maje – with trousers or jeans and flats from Kurt Keiger. I tend to try on new shapes every day so I change a lot throughout the day. What was your inspiration for the AW18 collection? I have always been inspired by interiors from the East. Ornate decor, rich textiles, interesting tiles and pattern – these inspirations translate to opulent fabrics and colours I have chosen for the season. There is a relaxed style to the AW18 collection, the overall effect is wearable with less occasionwear. Day dresses feature strongly and statement coats are fun and bold. The collection remains feminine with the fee G signature but moves to a more informal feel. What would your advice be to others hoping to have a career in fashion? Get some experience working for any designer successful in business even for a short time to see how things are done. It’s easier to learn from someone else’s mistakes, more costly on your own. Every designer or company works differently so even if you don’t love the style of designs or product you will gain valuable knowledge of delivering designs to suit the market. Don’t be afraid to work hard. Do your designs have a customer base? Are consumers willing to pay the price you want to sell at? Have you got a clear route to market? Can you deliver the quality that is required, can you follow up and deliver a good customer experience? These questions are really important to address before you launch. Go for it if you can answer your customer brief and remember to truly believe in your designs.